For the past few months, Chicago State University has been facing drastic changes within their financial and administrative system. Since Governor Bruce Rauner has been in office, he stalled on the state budget, causing students’ education to be jeopardized. The budget crisis has effected Chicago State and leaves the school in a limbo of if they will remain open, or shut down this coming March. Rauner proposed to make a 31 percent cut to higher education, to “cut waste”. He even indicated the financial issues Chicago State had in previous years as a supplemental reason to make cuts to the budget. Students and faculty members have staged many call to action protests in hopes of getting the state’s attention. On Thursday, January 28, 2016, protestors shut down all lanes on the Dan Ryan Expressway from the 95th street to 87th street exit, causing traffic jams. Their blocking the lanes on the expressway was symbolic to how the state’s legislators are blocking their chances at pursuing and achieving an education. 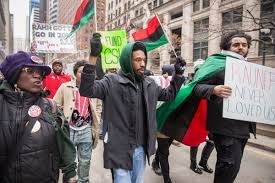 A little after a week on Monday, February 8, 2016 more protestors rallied in Downtowns Loop to protest the eight month delayed budget in Springfield that is forcing Chicago State to shut down before the end of the school year. Chicago State is known as the Southside’s university that gives opportunity to students from low-income homes to pursue an education. Recently, the Democratic Presidential Candidate, Bernie Sanders had announced that he will hold his campaign rally at Chicago State this past Thursday, February 25, 2016. Sanders’ campaign themes were based on providing income inequality and free education for college students. Hopefully his campaign will help with keeping Chicago States doors open, as they have just been forced to cancel their Spring Break in order to end the school year earlier and ensure their students graduate before the are forced to shut down. Chicago State does not have a monetary reserve to keep the school running, therefore meaning the school may close in March. Last week, Governor Rauner vetoed the MAP Grant proposal that would've helped students pay for college. Rauner answer for vetoing the bill was that the state doesn’t have the money. Chicago State is left in a stage of limbo. Not just the University, but the students, faculty, and staff. What are your thoughts on the current situation. Let us know.